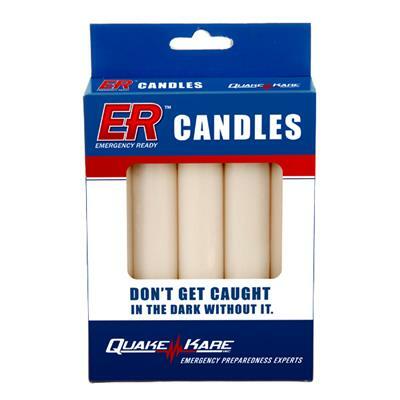 ER™ Candles provide up to 5-hours of emergency light during a power-outage. Includes 5 candles. Each candle burns brightly for 5 hours. ER™ Emergency Candles are a great addition to your emergency kit or outdoor supplies. Keep these candles in an easily accessible area in your home for unexpected power outages or use them to illuminate a campsite. Each candle burns for up to 5-hours. These candles are designed to fit in most candle lanterns. If you do not have a candle lantern, fill a bowl or container with sand and insert the candle. Recommended use with Waterproof Matches. (1) box of 5 candles: 3.75" x .75" x 6"